If you read this blog, you know that I like to shop at Daiso. Often in the comments I read that many of you wish you had a Daiso close by. 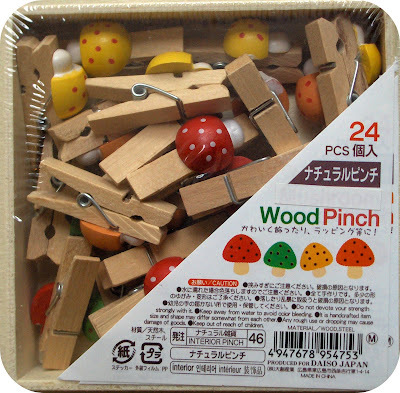 So, to bring a little Daiso your way, I purchased these cute mini mushroom clothespins to giveaway to one lucky winner. Leave a comment at the bottom of this post no later than Monday, September 27th, 2009. One entry per person. Please leave your email address in the comments if it's not linked to your profile. The email address is only used to notify the winner, I do not save the addresses. I'll choose one winner at random and post their name Tuesday. Contest open to everyone. Good Luck! Oh, I would love to be the lucky winner of this cute little Mushrooms. Thank you very much for offering this giveaway! These are so adorable!!! 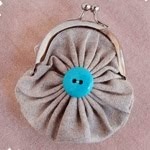 I love it when utilitarian items are made cute. Why can't all of life's little necessities be so sweet! I had never heard of Daiso. Now I have searched it on line and MUST go to one. These are the cutest clothes pins and would make the perfect craft to display my daughters artwork hanging from some ribbon. So adorable! They'd look so great next to the flower and ladybug clothespins on my wall! How generous!! Thank you so much!! i think these are the most adorable clothespins ever!! ooh, so cute! I'd love to win these! I'm new to your blog but I love it! Thanks for the giveaway! Those are so cute! Thanks for the chance to win! So cute! Thanks for the giveaway! I'm sooo envious of all the cute things you find at Daiso!!! Loving the mushrooms! Thank you for the chance to win this giveaway. Aw, those are so cute! Thank you for the oppotunity to win them! i never actually win anything, but a girl can dream. Darling clothespins! Thanks for the chance to win! Wow, those are so cute! Would love them for my preschool. Oh, to have a Daiso! gahhh the things i would use these for! so adorable. Super cute clothespins! I looked up Daiso and found there are several about 45 minutes away from me. I'll have to remember to look them up when I travel nearby! love the little wooden cuteness. I'm like a gazillion miles from a Daiso. Oh my gosh, those are so cute! Now I know why you love Daiso. And now I wish I lived near Daiso too! Lovely. Pefrect for keeping autumn notes on the string in our dinning room. So cute! I'm obsessed with mushrooms lately--especially the red ones with white dots. Just found your blog on The Mother Load and have added you to my favorites list. These mushroom pins would look great in my classroom, too! I would love those pins! My husband says they look like Super Mario Brothers mushrooms. My kids would love to see their school work hanging with those! I just found your blog and to say I am obsessed is a complete understatement! These are so adorable and I would love them. These are super cute. I'd love to be included in your giveaway! awesome, i would love to win that!!! 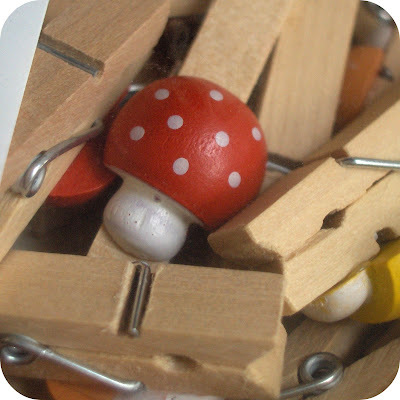 Everyone needs mushroom clothespins! Holy Cute! Cute! I'd love to share these with my daughter! Super cute! I love them...even if I don't love "real" mushrooms! Very Super Mario Bros.! Oh my, those are just the cutest!! We are quite the toadstool lover's in our home. These would be so cute to hang dolly clothes :D Thank you for the opportunity to win! put my name in the hat!! I love mushrooms and I love Daiso!! Thanks for offering this giveaway!! Kawaii giveaway! I can see my adorable grandkids little art projects hanging happily from those tiny mushroom clothespins. We do enjoy your blog. Happy Autumn from So.Cal! Would love to use those to hang up my kids artwork! Thank you for being so generous! The little mushrooms are adorable & I'd love to win them! I would love to have this, they are just so cute. Thank you for the contest! Cheers. The little mushrooms are beyond cute! i love the mushroom clips! so so cute! *sigh* I really do wish the East Coast had a Daiso...such cheap and cute stuff. Mushrooms are probably one of the top ten (TOP FIVE!) cutest things ever. me me me......pick me please!!! How cute! Wish I had a Daiso by me. How sweet! I would love to be the lucky one! These clothespins are so cute! How cute. I saw something like these as a child but havent seen them in a long time. I would love this. It's sooooo cute!!! I think it's even cuter when they made the packaging looks like a supermarket bento box or other food container. swoon. the clothpins are soooo cute. Aww! So cute! Me please! Daiso... come to a town near me, please!!! So sweet of you to have this giveaway! I started following your blog a little over a year ago and love all your sweet little projects. Thanks for all the inspiration! Greetings from Germany :)! Ohhh i don't know if Spain is too far!!! anyway, here my comment!! These are so, so cute! Thanks for offering this chance for everybody! I love to visit your blog. Adorable! I hope Daiso expands to a NYC location. These are so darling! My Daughter and I would be SOOO fighting over them if I win!!! They are really cute. I would love to be the winner. Thanks for the opportunity. these are so cute! i would love to have them - what a great giveaway... thanks!!! i would LOVE the chance to win these cute and fun clothes pins! i've got just the spot for them in my daughters room to hang her art work! TOTALLY STELLAR! I would love to win these for my friend Katety who loves Mushrooms and has done some very sweet things for me lately and I would like to repay her by giving her these awesome clothespins!!!! Very sweet of you to give them away!!! Oh. My. Cuteness! These are so amazingly fabulous! I love them! These clothes pins are special - thank you for offering this giveaway! These are adorable. I would love to gift them to my darling niece and nephews. Thank you for posting your blog. 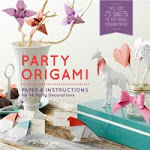 I enjoy reading of your creative, yet extremely easy-to-do (even for a klutz like myself!) crafts. Many of the ideas are also kid-oriented, which are perfect for delighting the little ones. How cute! I'm one of those people who long to shop at Daiso. I wish they would build one in Chicago! I would love these adorable little pins. Thank you so much for entering me in your drawing! Too cute! Mushrooms (and hedgies) are my faves. Those are too cute! I'd LOVE to use them on my air-powered-eco-clothes drier!!! b.e.a.utiful! we are a mushroom loving clan & those are simply delicious! aww!! PICK ME PICK ME! HEH! What a great giveaway! I have often wished there was a Daiso near me, too. Oooh! I love mushrooms. I can use these to hang pictures along a line in my kids room. So perfect! Thanks for the giveaway. These are soo-o cute it hurts! Oh, so cute. 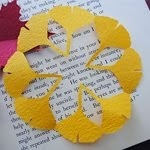 These would be perfect for some fall crafting. Thank you for your generousity.